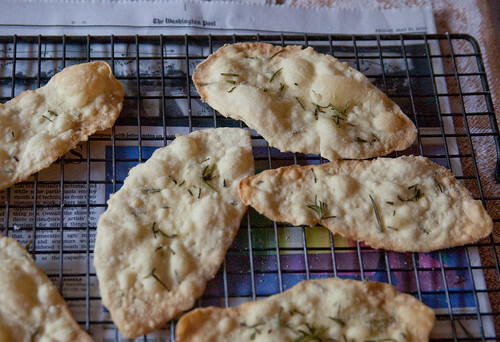 A Washington Post recipe for Rosemary Flatbread Crackers says “they couldn’t be easier.” So of course I wanted to try them as my swapping item to bring the Spring Del Ray Food Swap last week. 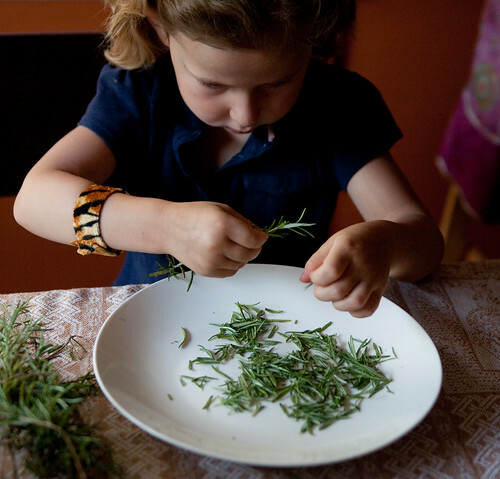 First, you harvest fresh rosemary and ideally enlist a small family member to pull the leaves from the stem. You’ll need about 2 T of coarsely chopped rosemary. Put a baking sheet on the middle rack of the oven and preheat the oven to 450. 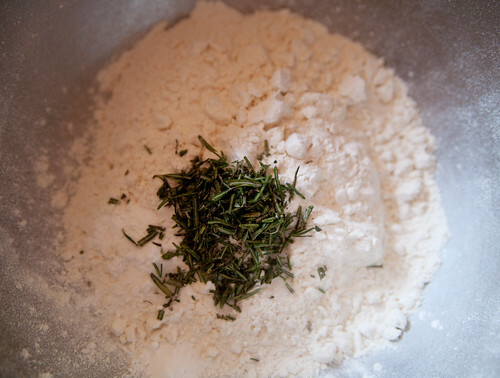 Stir 1 and 3/4 a cup of flour, 1 t of baking powder, 3/4 t of salt, and about 1 T of the rosemary together. In a well in the center, pour 1/2 cup of water and 1/3 cup of olive oil. Mine didn’t stay put in the well. 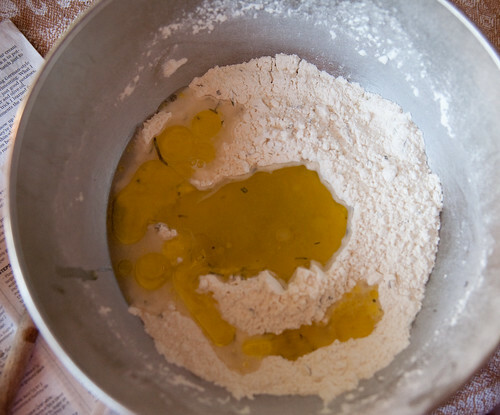 Stir the water and oil into the flour gradually. 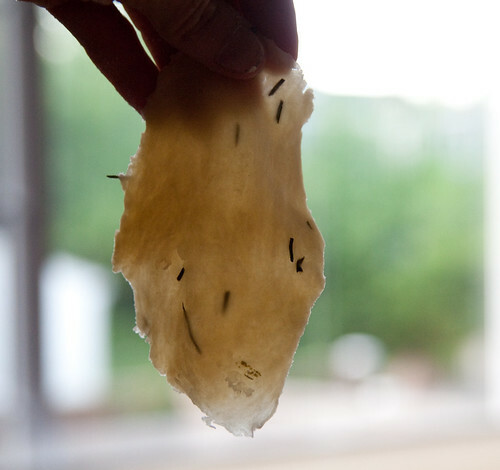 Divide the dough into 6 pieces and put them under plastic wrap so they stay moist. 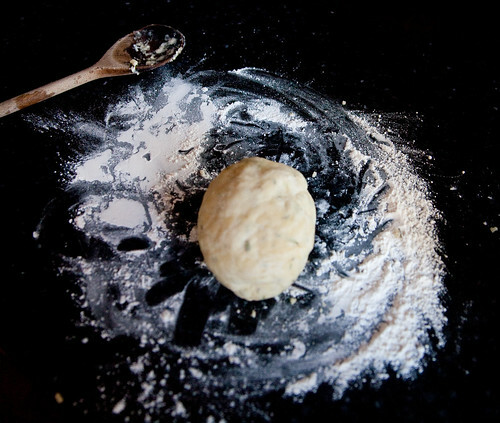 Take each ball and from it, roll out 6 crackers in the shape of a long oval. 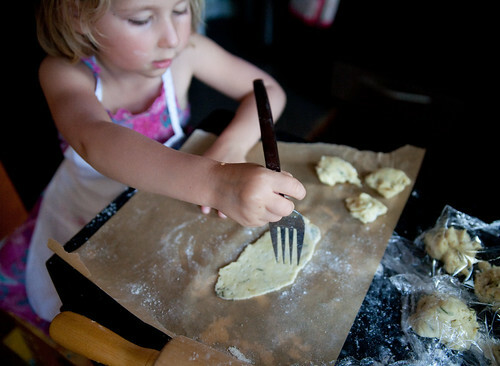 I let Nadja help, but I did most of the rolling so I could strive to make them as thin as possible. I’m holding this one up to the light so you can see how thin I made it. I also learned, after baking the first batch which took a really long time to brown, that it’s probably best to roll them using the least amount of flour on the rolling pin or surface you can manage. 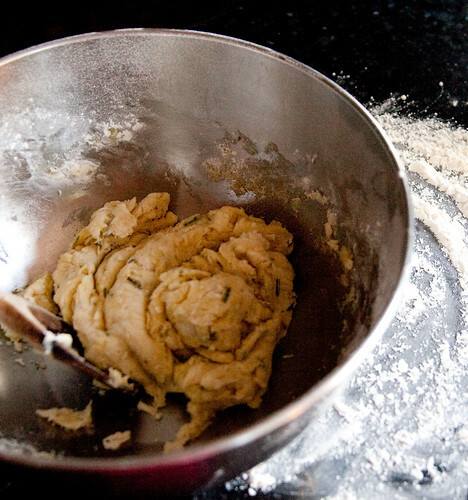 You want to keep the dough as moist as possible, so they brown and get crispier. 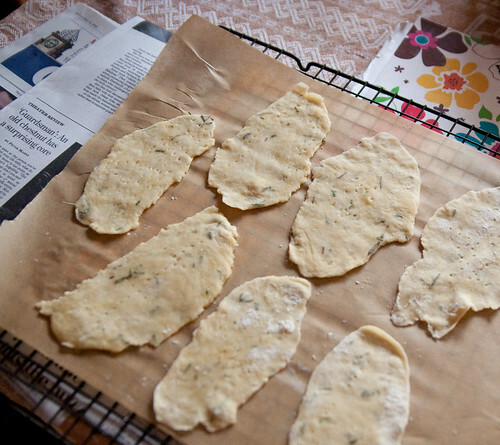 Before baking, prick the crackers with the tines of a fork. 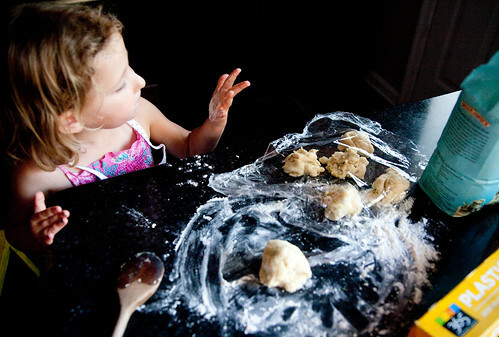 Arrange the dough on parchment paper. Brush the tops with olive oil and sprinkle some more rosemary and salt on top. 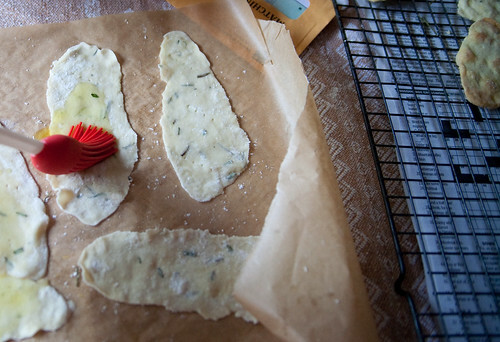 Slide the dough with the parchment paper onto the oven in the rack. I found I could only fit about 7 crackers in the oven at a time. While one set was baking, I’d roll out another set. The recipe says they take about 4-6 minutes to brown, but I found they took about 8-9 minutes in my oven. 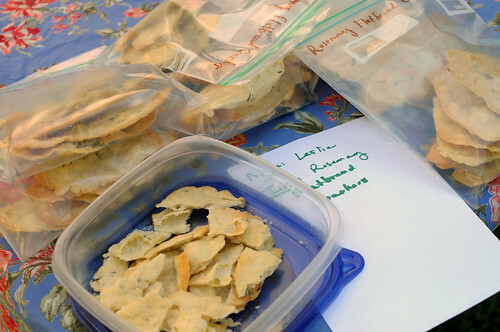 I made two batches to bring to our Spring Food Swap, about 40 crackers in all, against my family’s pleas to let them eat every single one. 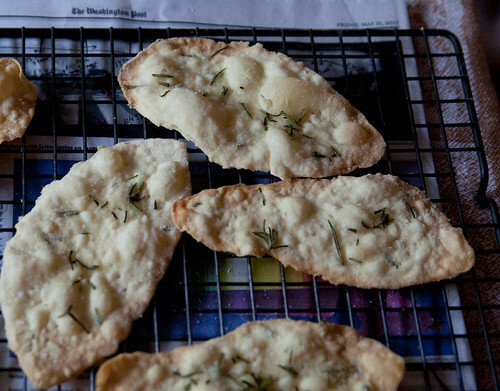 My final assessment: The rosemary flatbread crackers are fun as a novelty recipe and the taste is excellent. I wouldn’t make them as a pantry staple, though, even though the ingredients are simple items most of us always have on hand. Also, even though the tasted great, they could have been crispier. I’d like to try to increase their crunch. But how? Any ideas of what part of the recipe to adjust? The recipe calls for a heavy baking sheet. I think mine was a standard weight. Would a heavier one help? 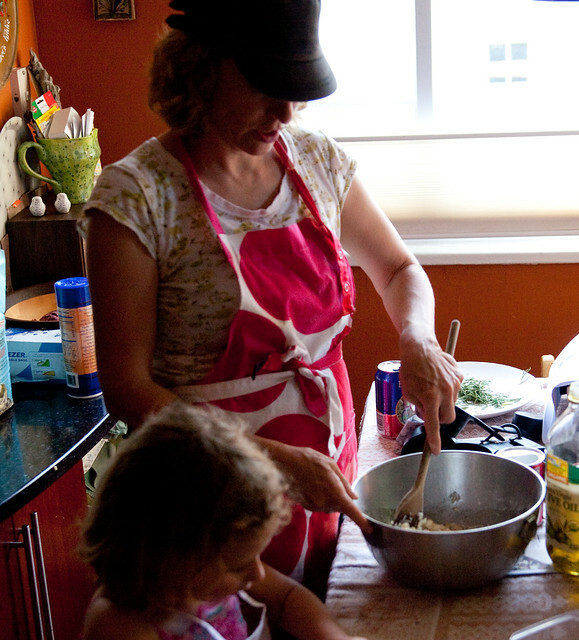 Should I use the best olive oil I can buy? Was my dough not as shaggy and soft as the recipe described? Should I try to roll them even thinner? I had to look up a silpat, Nancy. 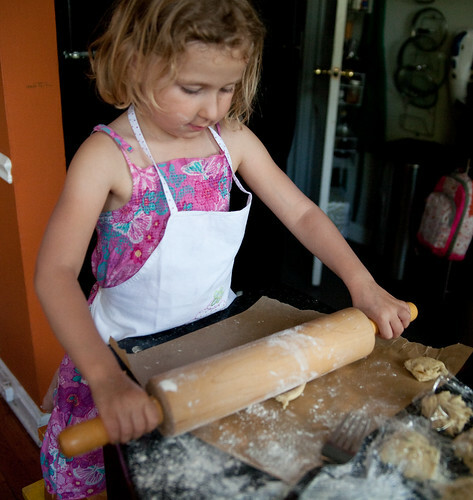 I can see how useful they would be for this recipe, for both rolling the dough and baking. Thanks for the idea! Also, the day I baked these, it was in the high 80s and humid.